Clontuskert is an entirely rural parish. The majority of its inhabitants are farmers, deriving their living from its fertile soil. The majority of the remainder work in the local town of Ballinasloe or further afield in Athlone or Galway. Access to these towns or places further afield has improved dramatically since the opening of the new M6 motorway linking Galway and Dublin. You can see exactly where we are by clicking here. There are two exit junctions (14 and 15) within a few Km of Clontuskert. Clontuskert has experienced significant change since the first hunter-gatherers roamed the area after the last Ice Age. Bronze Age burial mounds survive, dating from c. 2000 B.C. as well as a variety of artefacts, such as weapons and tools. 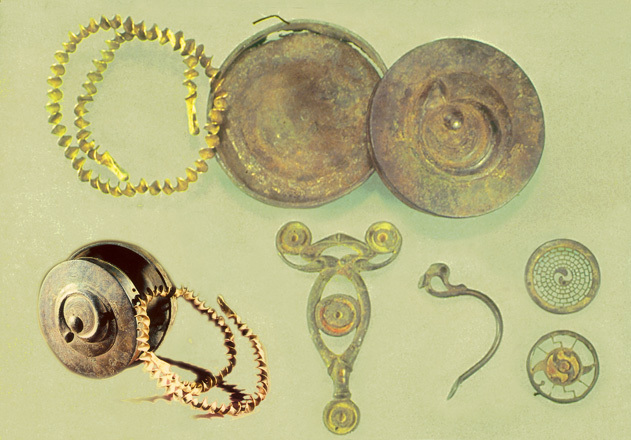 A hoard of Iron Age gold and copper decorative objects is now housed in the National Museum. The landscape of the parish is studded with more than a hundred ringforts - structures dating from the 2nd century A.D. to the middle of the 14th century. These ringforts have witnessed the arrival of Christianity in Clontuskert, St. Baetán’s first monastic foundation in 704 A.D., the laying of the foundation stone at Clontuskert Priory in 1180 and the changes following the Reformation in the time of Henry the Eighth. Many of Ireland’s broader historic movements were mirrored in Clontuskert’s long history: the arrival of foreign invaders, the establishment of the landlord classes, the battle of Aughrim, the Great Famine, the bitter land struggles, the development of the educational system and the War of Independence.